Last week, Riot unveiled “Kindred,” the newest champion for its wildly popular online game League of Legends. It’s far too early to say anything definitive about Kindred’s gameplay qualities, but one thing is already clear: the champ’s production values are amazing. Lamb is the ethereal white archer, while Wolf is the fanged purple wraith that circles around her and lunges towards enemies at his comrade’s command. This isn’t is “two-for-one” character like those seen in League’s close competitors Dota 2 and Heroes of the Storm—Riot developers have made it clear they’re not that eager to add that level of micromanagement to the game. The thing that makes them really cool in my eyes, therefore, is the lore artwork behind the pair. “So he would always have a friend?” Wolf asks. “So he would always have a friend,” Lamb replies. They may not end up being the duo Lamb is speaking of, but the combination of Kindred’s banter and the foreboding music makes the hair on the back of my head stand up. Riot has long had an unusual knack for making characters who are genuinely frightening—something that’s all the more impressive when you consider that League of Legends is a team-based multiplayer game that wouldn’t seem well designed for such a thing. Their rework of the undead zombie-esque warrior Sion turned a crappy Arnold Schwarzenegger lookalike into a savage beast who’s absolutely terrifying the first few times you confront him. “Never one,” Lamb whispers in one particularly striking line. “...without the other,” Wolf growls in response. Wolf: I am, little Lamb. Lamb: What does it feel like? Wolf: A long hunt with no kill. I’m particularly impressed with Wolf’s VO work. The way he snarls to punctuate every sentence really makes you feel every word. League of Legends has a (mostly unfair) reputation among gamers for being sort of...cheap and ugly-looking—a reputation that largely comes from what it looked and sounded like years ago. But for the people who’ve kept up with the game’s growth over the past 5 years, it’s incredible to see how much Riot has improved its craft. In other words: keep up the good work, Rito. 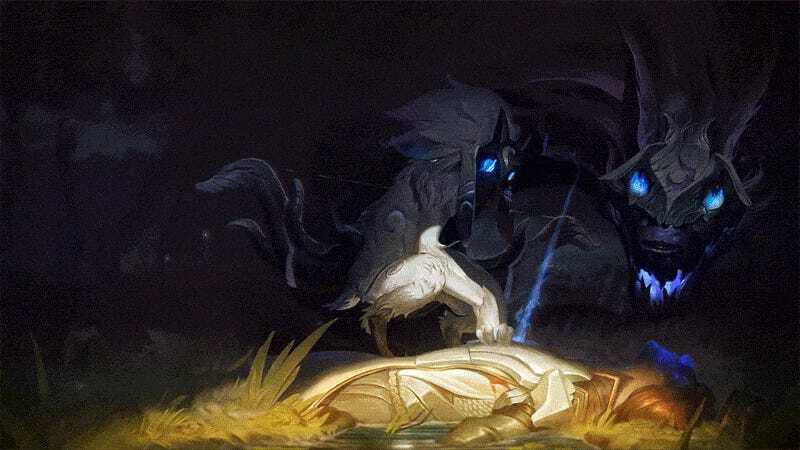 For impressions on Kindred’s actual gameplay vs. their production values, check out this detailed write-up by RerTV over at Kotaku’s reader-run blog TAY.